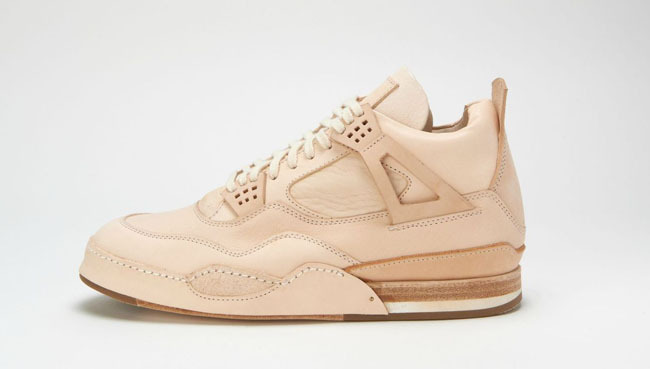 Check out Hender Scheme's most ambitious project yet. We've seen Hender Scheme's take on classic silhouettes like the Air Force 1 and Vans Authentic, in the past. But the Air Jordan 4 is, by far, their most ambitious project yet. Forces and Vans, in comparison, feature fairly simple silhouettes. The Air Jordan 4 on the other hand, with its multitude of layers and molded parts, feels high-tech even 25 years after it was originally released. So, its re-creation in natural leather, love it or hate it, is quite a feat. The concept behind Hender Scheme's "homage" sneakers is to recreate these iconic models, by hand, in raw leather. This allows them to develop their own patinas, and age over time. Unsurprisingly, that comes at a price, with their Forces ringing up in the $1,000-range. While there's no price or release info available yet, look for these to be considerably more based on the amount of additional detail required by the Air Jordan 4's design.